If you use your deep fryer all the time, change the oil every few days because oils can go rancid and make you sick. Plus, it will build up a mess of nasty old food that’s not good to eat either. I never liked to put fresh French fries into last week’s cooling oil for fish. The grime will be harder to clean the longer you wait to clean the deep fryer. Clean it after each use if you use it seldom. Never ever put your housing unit in the sink with water over the top or in the dishwasher. The outside housing must be cleaned by hand or you could ruin its electronics. Always read the instructions or User’s Manual that came with your deep fryer. If you don’t have it, you can find manuals online using the model number on the bottom or side of your unit. 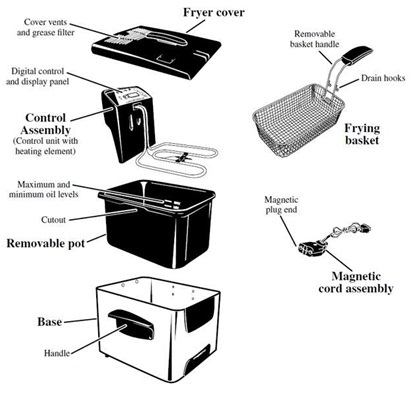 Different brands and models of air fryers have different instructions for cleaning and maintenance. Don’t use knives, forks, or metal utensils to remove dried caked food from your deep fryer. Most of today’s deep fryers have some parts that go into the dishwasher. But if not, try these methods. Step 1. Wait until the air fryer cools to the touch and unplug it from the wall and the fryer unless it is hard wired to the unit. Never clean it when its plugged in. Be sure all the old food is out of the interior pot. Never submerge the pot with plug electronics into water; it will be ruined forever. Never ever add water to the hot oil; it can explode causing serious burns and damage. Step 2. Cleaning the deep fryer is straightforward but takes time and steps to do it. Drain the oil when it’s cool but not thickened to be solid or semi-solid. If you want to use it again, save it to a container and refrigerate. Never put oil or grease down your drain or toilet; it will clog your drain for an expensive repair. Just put in a plastic container that’s of no use and trash it that way. I let it get hard in the fridge, then put it into my outgoing trash container for the waste disposal truck. Step 3. Wash the cooking basket in dishwashing detergent in hot water. Most of the newer fryer component parts can go into the dishwasher, but not the housing with the electrical port. Wipe down the housing inside and out with dishwashing detergent, rinse, and towel dry. Some parts such as the basket and basket holder are dishwasher safe, and you can use an old toothbrush to scrape off food particles, but check your User’s Guide. You can scrape off burned or stuck food with a plastic or rubber pan scraper or spatula, but not metal that will scratch. If you have crusty hard food stuck to your air fryer, make a paste of baking soda and water and scrub with a sponge, rinse, and towel dry. You can use this paste gently on the heating element with an old soft toothbrush at the bottom of your deep fryer. If you still have sticky oily residue, use baking soda paste to remove it, sponge it around in circulation motions but do not use any abrasive cleaners or chemicals. Rinse and towel dry. Step 4. If the deep fryer’s heating element is dirty, wipe it clean. Some deep fryers have two metal rods that you can wipe clean. If you have thin wires, check your User’s Manual. Some heating elements can be removed to clean, and some have a hinge. Be sure to use extra care in handling this part; it can easily break. Step 5. Fill a container with hot water and fill the fryer with it to the area you were cooking at. Let it sit about a half hour. Clean the other pieces while you wait. You can plug the fryer in for it to get hotter and “cook” off the debris, but watch it; it cannot boil dry. Give the pot a final cleaning by dumping half of the water into the sink. Use a sponge or cloth to wipe the insides and bottom, then dump that water out, rinse, and towel dry. Step 6. If your deep fryer uses filters, either replace them or clean them. See your User’s Manual for instructions to see if they are removable for cleaning. If they are foam grease filters, they can be washed in dish detergent in hot water. Rinse, and let them air dry. Charcoal odor filters are not washable and must be replaced. You can put the lid in detergent water if the filters cannot be removed. Rinse the lid, and dry. You can always do a final rinse with vinegar water. Put one-half cup of clear distilled vinegar into a quart of warm water and move it about with your sponge. Vinegar will also neutralize any soap residue for a fresh deep fryer. Then rinse again with clear water to remove the vinegar smell. Step 7. Let all parts and the deep fryer air dry for a few hours too before putting it away. Tip: Clean the deep fryer after each time it’s used; don’t wait until it’s a hard stuck-on mess before cleaning.